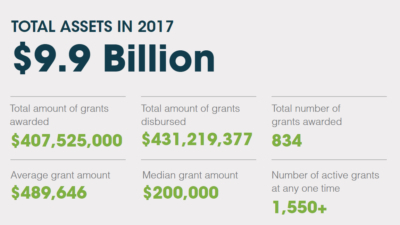 What does Hewlett Foundation focus on in its grantmaking? The Hewlett Foundation makes grants in education, environment, global development and population, performing arts, and the philanthropy sector, as well as to support disadvantaged communities in the Bay Area. In addition, the foundation reserves funding for special projects, and has two initiatives that are time-limited, one that is focused on cybersecurity and another related to U.S. democracy. The foundation’s grants are awarded solely for charitable purposes. How does the foundation determine what organizations to support? We fund organizations working in areas that align with the goals and strategies of our programs and initiatives. Most of our grants are awarded to organizations identified by the foundation. From time to time, the foundation invites letters of inquiry and other types of proposals through open processes. Recent examples include our Hewlett 50 Arts Commissions, a call for proposals for African policy research institutions, and a request for proposals related to climate finance and sustainable retail banking. To be informed when those opportunities arise, please sign up for our email updates and follow us on Twitter. Outside of these opportunities, the foundation generally does not accept unsolicited letters of inquiry. Do your programs ever collaborate on grants? Although our programs pursue specific, individual strategies, from time to time they do collaborate on a grant when its purpose is applicable to both programs. Programs also sometimes make grants collaboratively with Special Projects when unexpected opportunities arise that are important for advancing their mission, but outside their budget for the year or only tangentially related to their defined strategies. In addition, our Organizational Effectiveness grantmaking is intended specifically to support the work of grantees of our other programs and initiatives. For these reasons, some grants are listed under multiple programs and strategies across our website. If you have questions about grants data, please contact us. Does the foundation provide scholarships? The foundation does not fund individuals, scholarships, unincorporated associations or groups. Moreover, the foundation’s funds can be used only for purposes that are consistent with its status as a nonpartisan, charitable organization. For example, we do not fund political candidates or political action committees. Do you make program-related investments (PRIs)? We focus on creating social benefit through our grants and related philanthropic activities, and generally do not make program-related investments — that is, financial instruments, such as loans, guarantees, and equity investments, designed to support charitable purposes that qualify toward a foundation’s five percent payout requirement. Our social investment policy provides more details. Can grants be made to a fiscal sponsor? Yes, the foundation permits organizations to use fiscal sponsors. Can grantees provide feedback to the foundation? Grantees are welcome to provide comments directly to program staff or by emailing granteefeedback@hewlett.org about any aspect of our grantmaking process. Grantees can also submit comments anonymously through a third-party website. Responses are collected and relayed back to the foundation without any identifying information.